Small airboats go faster and a little more intimate with a smaller group. 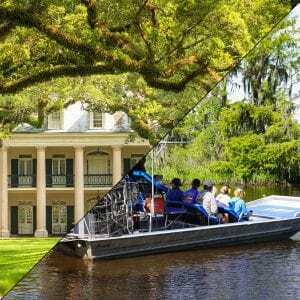 On this tour, you will experience the best of both: an informative swamp tour and high speed thrill airboat ride. You will travel at high speeds in the airboat then slow down and stop for pictures. Your Captain will give you a tour of a life time explaining the culture, animals, and the swamps. You may even experience a close encounter with some of the local swamp life. You will return to you hotel around 5:00pm.